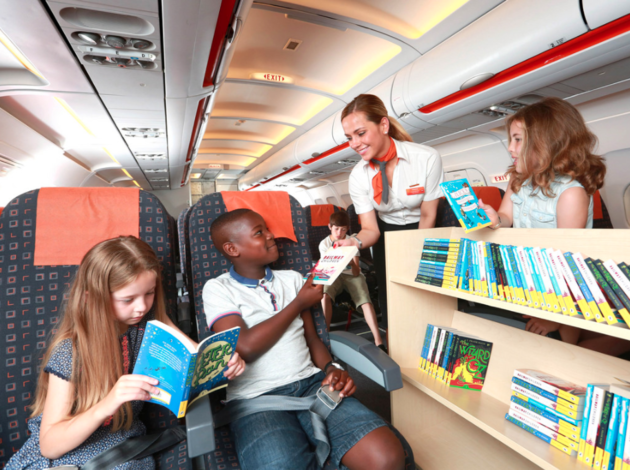 easyJet has launched a new initiative ‘Flybraries’ (flying libraries) following new research that suggests that the number of children reading for pleasure is at an all-time low. Seven thousand copies of children’s classics including Peter Pan, Alice’s Adventures In Wonderland, The Wizard Of Oz, and The Railway Children will be made available on easyJet’s fleet. Kids can start reading them on the flight and then when they land download free samples of other classics to try from easyjet.com/bookclub. Children will leave the books on board for the next passenger to enjoy. 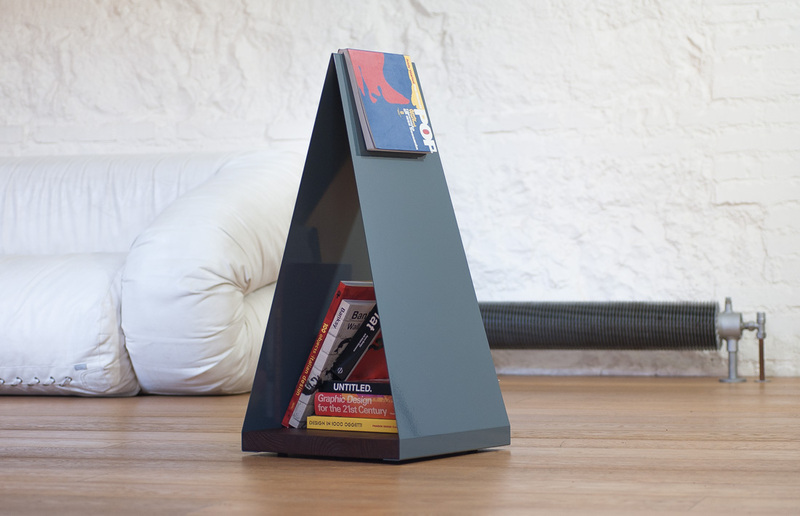 Bookshelves are making a comeback in living rooms as a "shelfie" interior design craze is sweeping the UK... 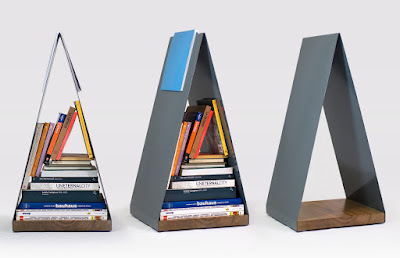 Experts said consumers' growing tendency to invest in physical books was partly down to a trend for bookshelves, which they believe make them look more interesting to dinner party guests and on social media. The biggest question for every bibliophile when they move in with a loved one is: do we merge collections? 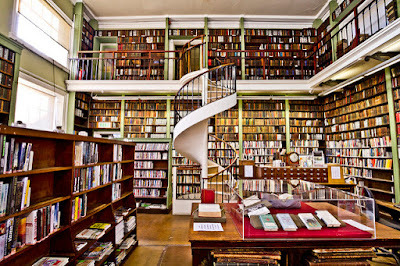 Mrs Dalloway believed that love and religion would destroy the privacy of the soul; she’d agree with me that merging collections threatens the same. 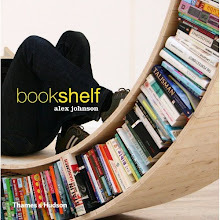 But perhaps those taking shelfies are right and books are soul music, made for sharing on gloriously open shelves. Das LINK Regalsystem besticht durch seine Einfachheit und Funktionalität. Auf das Wesentliche reduziert erlauben die frei arrangierbaren Vollholz-Regalbretter und Hängevorrichtungen aus Stahl flexible und individuelle Konstruktionen. Jörg Final 29.02.2016 (Assemble korr. )_HD from Jörg Höltje on Vimeo. 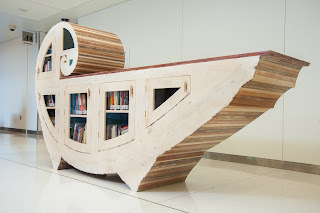 The body of this piece is loosely derived from the image of a boat on water and is designed to remind the viewer that books (and education in general) can be a form of transportation. Plywood, reclaimed wood, wood, fasteners & hardware, plexiglass, paint, ink, dye, lacquer, wax with two ink on paper drawings framed in wood by the artist. 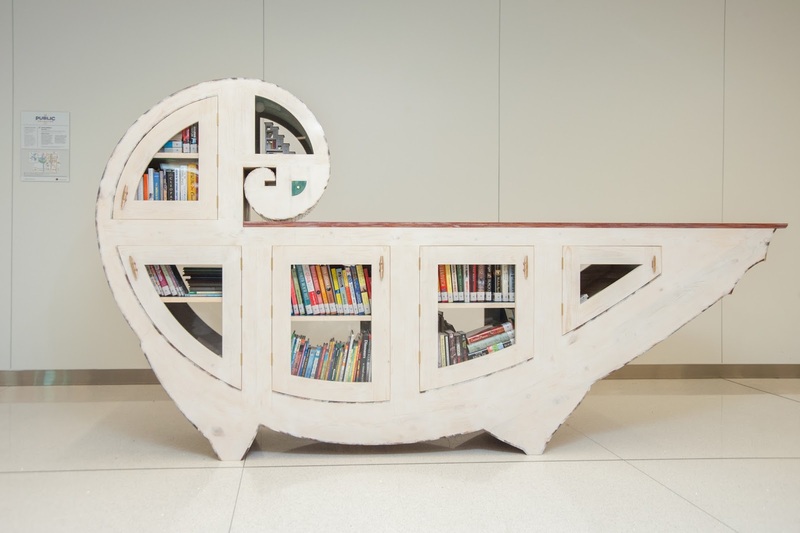 Katie Hudnall for The Public Collection a public art and literacy project consisting of artist-designed book share stations, developed to increase access to books and art. This summer, 58 book-shaped benches are on display across Manchester for you to enjoy (above, Elmer the Elephant by St Luke's CE Primary School, Longsight). 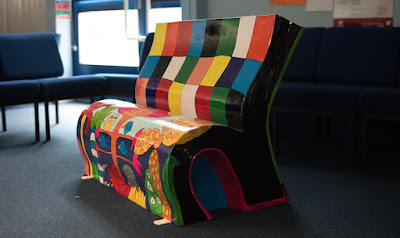 The BookBenches have been designed by local children and community groups, who were inspired by books and reading. 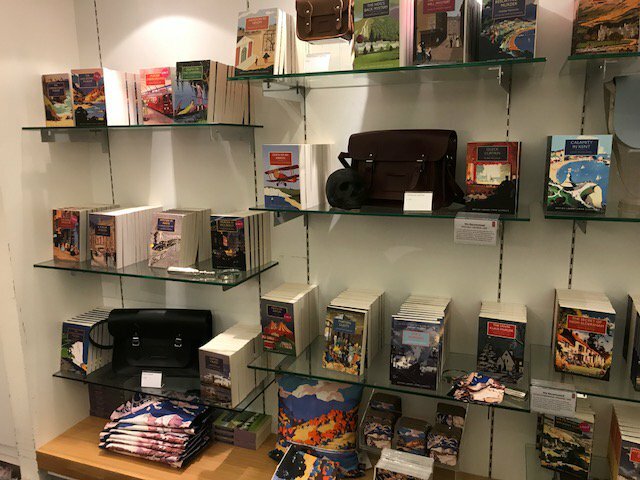 To celebrate the exhibition, there are lots of events taking place over the summer at the venues where the BookBenches are on display. You can also follow a trail between the BookBenches and children can complete fun activities along the way. 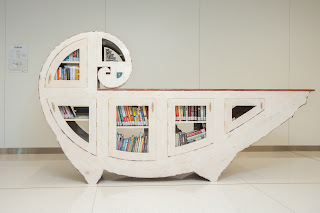 In partnership with Wild in Art, the BookBench project is part of the Read Manchester campaign from Manchester City Council and the National Literacy Trust. The campaign promotes reading across the city to boost literacy levels. Drawing his inspiration from the relationship between architectural space and the human body, the Japanese architect styled a compact, essential bookcase from which you can extract a chair. A veritable object within the object, which underscores the relationship between people and books: after choosing a book, the reader can take the chair and sit down to read it. 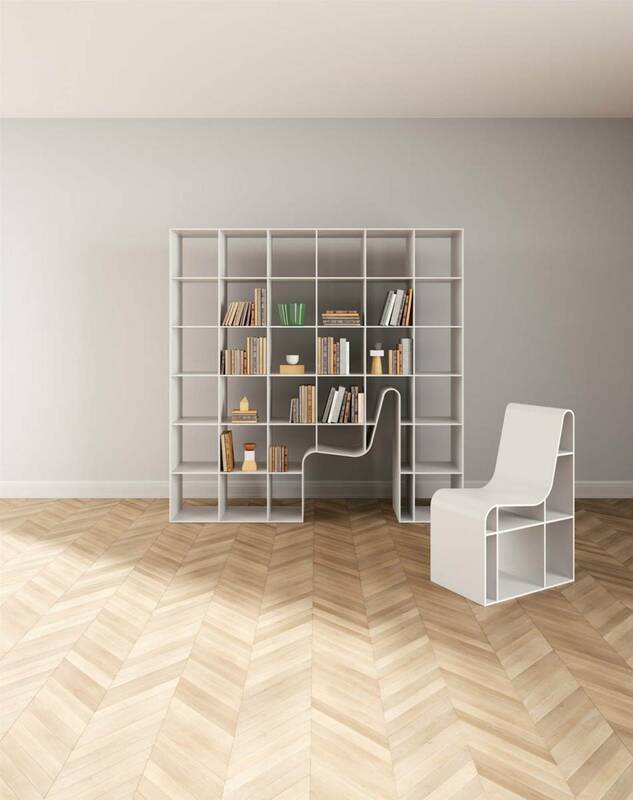 Bookchair is available in one colour only – white – in order to underline the abstractness of the product and the strong ties between the content and the container, between the container and the user.